Prince Charles speaks with a guest at an event in Lagos, Nigeria, where he delivered a speech using phrases in pidgin English. Pidgin English is the lingua franca in Nigeria, where more than 300 languages are spoken, according to Francesco Goglia, a researcher at the University of Manchester. A hybrid of English and local languages, it traces its roots to the Atlantic slave trade in the 17th century. More than 75 million people are believed to speak pidgin across Nigeria, Ghana, Cameroon and Equatorial Guinea. But it's not just an African phenomenon. The term "pidgin" was first recorded in English in 1807 in Canton, China. In this hub for business and trade, people spoke "business English" to get by — often spelled as "pigeon English," reflecting local pronunciation of the word "business," according to Salikoko Sangol Mufwene, a professor of linguistics at the University of Chicago. In the past, Nigerian pidgin English was seen as a language for uneducated people. Today, the language is widespread among all social classes and is increasingly popular among young people, writers, politicians and musicians. 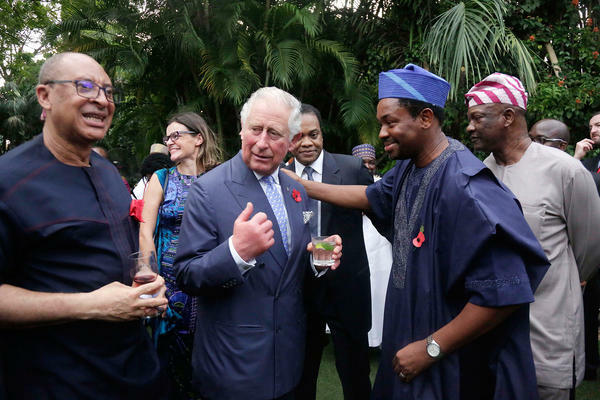 For the most part, Nigerians were charmed by Prince Charles' efforts to speak pidgin, says Ifeanyi Nsofor, director of policy and advocacy at a health group called Nigeria Health Watch and a 2018 Aspen Fellow. "It was cute and amusing. It symbolizes respect — and I think Nigerians appreciate that," he says. That sentiment echoed on social media. One Nigerian called the effort "heartwarming." Another wrote, "Prince Charles has shown it's never too late to drop airs and graces to try to integrate with the culture of a people." Still, there were critics. Some Nigerians wondered why it made international headlines. "Prince Charles spoke pidgin English in Lagos, so what!" tweeted one person. Another questioned why Nigerians were "doing backflips" for a former colonizer. We talked to Nsofor about pidgin, a language that he speaks with his friends, at home and in his work as a health advocate. This interview has been edited for length and clarity. How did people react when they heard Prince Charles speaking pidgin? The general feeling is that people thought it was a good thing, respectful but also funny. He was speaking pidgin with a British accent, which you could hear if you were listening closely. Is it common for foreign dignitaries to speak pidgin on trips to Nigeria? We don't really hear pidgin English that often, but depending on what part of the country they're in, they'll try saying one or two phrases in the local language. If you're in an Igbo-speaking area, a person might say "good morning" in Igbo. It's an icebreaker — look, a white guy is speaking our language! People do that routinely to show that they understand and appreciate the local culture. Was it offensive that a member of the British crown — which ruled Nigeria for decades — was speaking in pidgin English? To be honest, not really. It's been 60 years since the British left as our colonial masters. We don't really make that connection when we see a British person anymore. Did Nigerians ever look down on speakers of pidgin? I remember when I was in primary and secondary school, if you spoke pidgin, you were asked to pay a fine. You were expected to speak formal English — Queen's English — in school. Pidgin is having its moment. In 2011, Google launched its search engine in pidgin, and in 2017, BBC launched a news site in the language. I'm not sure the moment will stop. Even before Google and BBC, local radio stations — about five or six years ago — begin broadcasting in pidgin. One of the biggest radio stations, Wazobia FM, is an example. And a lot of comedians in Nigeria have started to do their comedy bits in pidgin. When you say it in pidgin, it makes the joke funnier, because people really understand what you're saying. When do people speak pidgin? When you hang out with friends, you speak pidgin more. When I think of myself, my wife and I speak pidgin English when we're chatting on WhatsApp or on the phone. I don't even know how that happens. Talking to my wife in Queen's English is too formal. At Nigeria Health Watch, we conduct radio shows in pidgin to reach a wider audience. For example, we talk about family planning in pidgin if we want the message to get through to people. So when people are hanging out, say at a café, they're speaking pidgin. What happens if they speak Queen's English? Some people will mock you! It's ever evolving. The kind of pidgin English we spoke when we were kids is different to what we speak now. There are new words and expressions that have come up. What are some cool phrases I should know? "How far?" It can mean so many things: How are you? Are you OK? What is happening? And "Wetin dey happen?" which also means: What is happening? But also, What are we going to do? Another phrase is "wetin concern agbero with overload," which is a way of saying one is indifferent about a particular situation. Agberos are individuals who load vehicles at motor parks in Nigeria. They usually overload such vehicles and are not usually bothered about the impact of doing so. Was what Prince Charles said in his remarks to Nigerians particularly hip or cool? Yes! The things he said — "butter my bread" and "pepper soup" — they're phrases that people actually say. More like a proverb. Any other phrases I should know? Wehdonma. It means thank you to an important lady.